Hebrides. Originally built in the 18th Century, the lodge has been completely modernized in 2009/10 without losing its traditional Highland character. 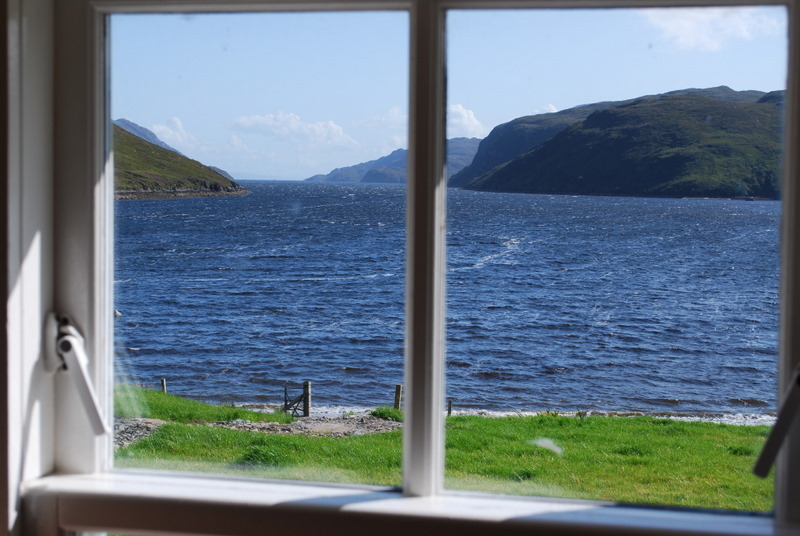 Guests are provided with five double or twin bedrooms (up to 10 more beds are available by arrangement in the nearby Tarbert and Seaforth Cottages). The newly-built sunroom gives fabulous views in three directions, while the billiards room and nearby sauna complex (with table tennis) offer great entertainment in the evening. The lodge is offered on a self-catered basis. Hard work has also been done over the past couple years to restore and extend the charming gardens behind Aline Lodge. These can be particularly enjoyed from the three bedrooms at the back of the house. The 16 ft Arran sea boat is available to guests at the lodge, and a larger sea boat, the 27 ft Targa, is available by separate arrangement. The Arran is suitable for exploring Loch Seaforth, dropping prawn pots, and visiting Seaforth Island. The Targa can take guests on further trips, to the Shiant islands and elsewhere along the coast of Harris. Wildlife abounds at Aline, golden eagles, peregrines, merlins, sea eagles, divers, seals, otters, dolphins and whales all may be spotted, sometimes from the Lodge, sometimes from one of the sea boats. The beaches of Lewis and Harris are nearby and ideal for a Sunday picnic. Day trips to the 800 acre Seaforth Island, which is part of the estate, can be made, to enjoy walks and picnics. The Lodge is let for £3,360 per week in the low season (May, June), £3,750 in the mid season (July, November) and £4,400 in the high season (August, September, October). Parties larger than 10 can be accommodated with overflow in the Seaforth and/or Tarbert cottages (if available) by separate arrangement. Copyright © 2010 www.aline-estate.co.uk. All Rights Reserved.